Welcome to Sabaku Samurai: Fine Japanese Weapons and Art, a site run by goofy old farts with the unfortunate affliction of collecting Japanese swords and related antiquities. At SabakuSamurai.com we share pictures, thoughts, and sometimes sell our treasures. Browse and enjoy, and don't forget to check out our Blog! Welcome Aboard! P.S Click the top to see our secret page!!! Click here to view blog! BIG CHANGES!!! Inspired by our swords, we are going to start making SabakuSamurai.com "cutting edge"... provided we don't get consumed with creating punny analogies. During this time we are hoping to make better use of the Sabaku Blog for great pics and posts. I am thrilled to be able to showcase two wonderful blades by this master. The first is quintessential Gassan, a spectacular 26 3/4 inch katana made in perfect ayasugi hada in fresh polish by master polisher Takeo Seki.Click Here to see more. The second has a cutting edge of only 6 7/10 inches long the second Sadakatsu blade is an absolute little gem. It is made in rare kiriha style and features exquisite horimono by Sadakatsu himself. One side features a dragon carved in deep relief and the other a perfect ken sword. Click Here to see more. Recently a friend of mine acquired a very interesting sword that I want to share with you. I am fairly certain he got the sword for the soul purpose of making me green with envy. He succeeded. Click here to see pictures and description. Some one took pictures of my sword unsheathed! Get this book and you can see pictures of my ken in all of its glory, and by ken I mean my sword, and by sword I mean a metal antiquity in my collection... Click the picture to see!!! 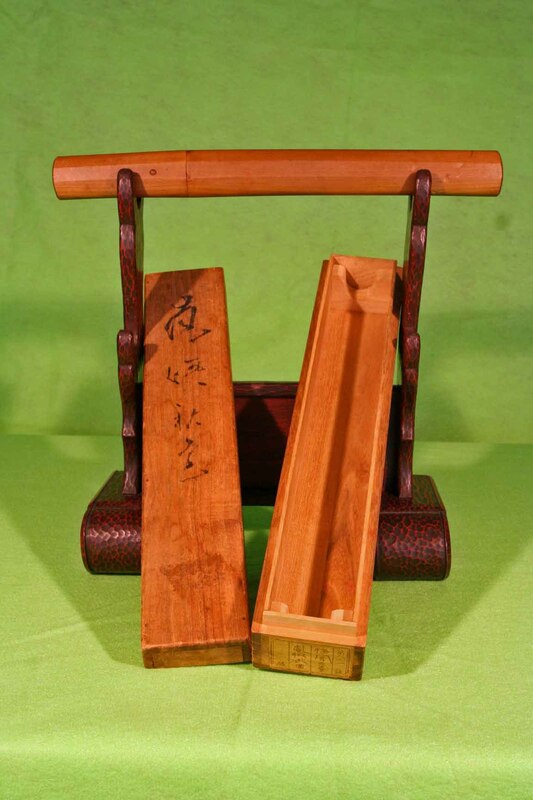 Japanese Swords: Cultural Icons of a Nation. GASSAN from John Scott Slough's Oshigata Book!!! Just back from polish by master polisher Jimmy Hayashi is another fantastic Gassan Sadakatsu. It has all the bells and whistles. This is the sword dreams are made of... but don't take this thing to bed cuz It'll cut you good...I have the scars to proove it. What can I say, the Sabaku Samurai lives life on the wild side! I have another awsum Gassan Sadakatsu to show. It don't get much better than this! Very rare kogarasu style tanto in ORIGINAL polish, in original DOUBLE presentation boxes, in original sword bag, original habaki, signed and dated with NBTHK Hozon papers. Flawless, Perfect. 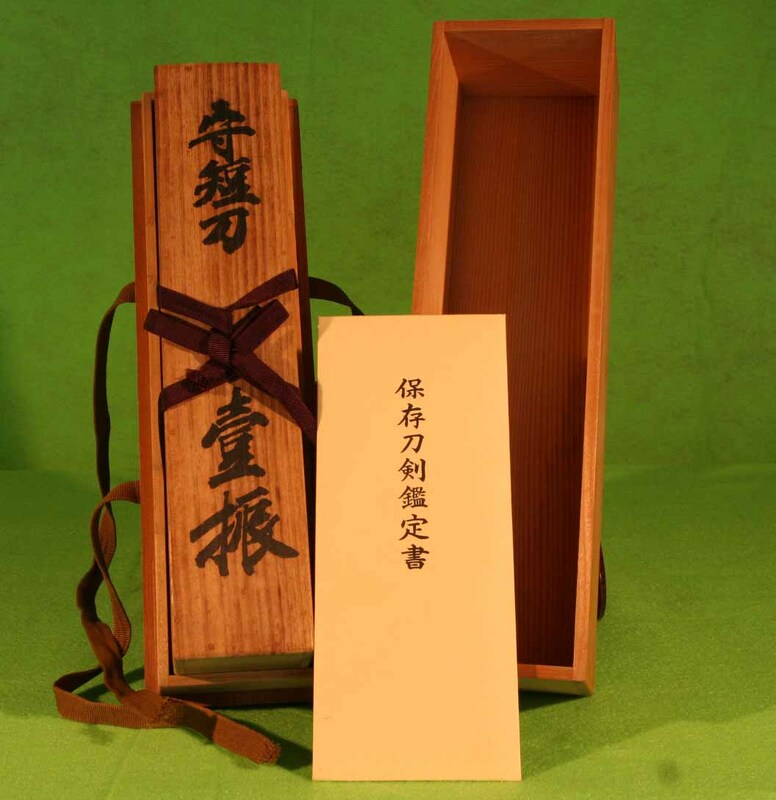 Here's a super package for you, a Yasukuni Shrine Daisho by Kotani Yasunori, the Last Living Yasukuni Shrine sword smith. Click the picture cuz you've gotta check these out. I even wrote up a little history lesson with 'em for you. Just think of it as school Sabaku Samurai style.